shown with the more recent exterior siding and an addition as it appeared looking towards the northeast in 1958. After that are some pictures taken in 1993 of the remains of his home after it was torched by juvenile vandals. His 1796 home and land was located in Longswamp Township about 1/4 mile north of Seisholtzville, Hereford Township, Berks County, PA.
line separating Hereford Township and Longswamp Township. His home was on the northeast, right side of the road. The home was located roughly where the term "102 P", i.e., 102 perches, is noted on the plat plan above. 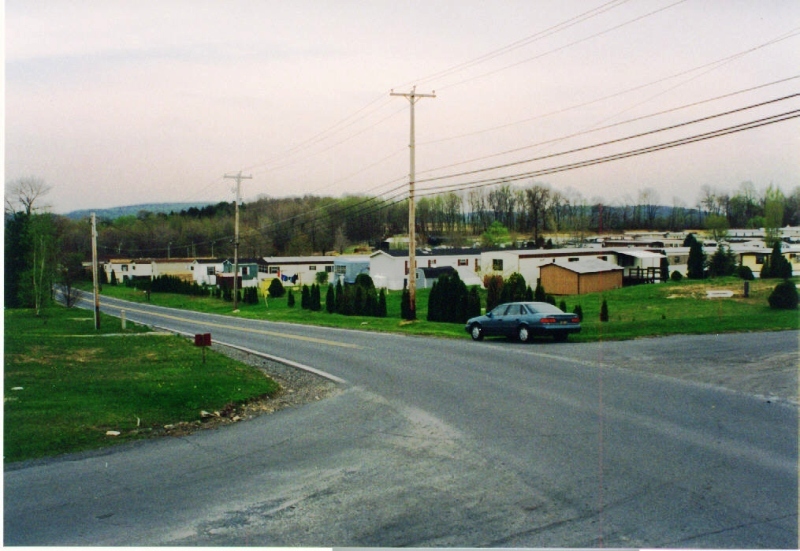 The Mountain Village Mobile Home Park was built on parts of the two tracks of his land on the southwest, left side of road. 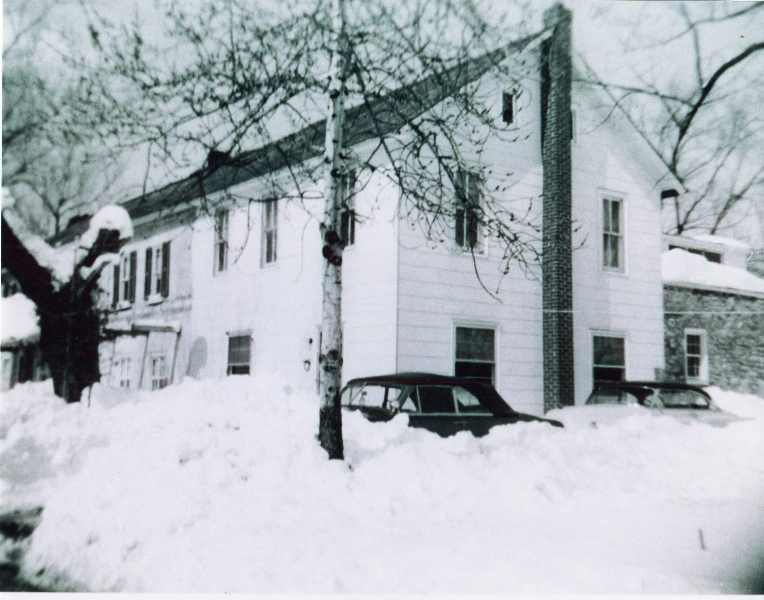 Picture of Frederick Kerchner's home taken in March 1958 after a blizzard. The photo taken by the Walker family which owned the property at the time of the picture. Photo copied in April 1993 by Charles F. Kerchner, Jr., a direct descendant of Frederick Kerchner. 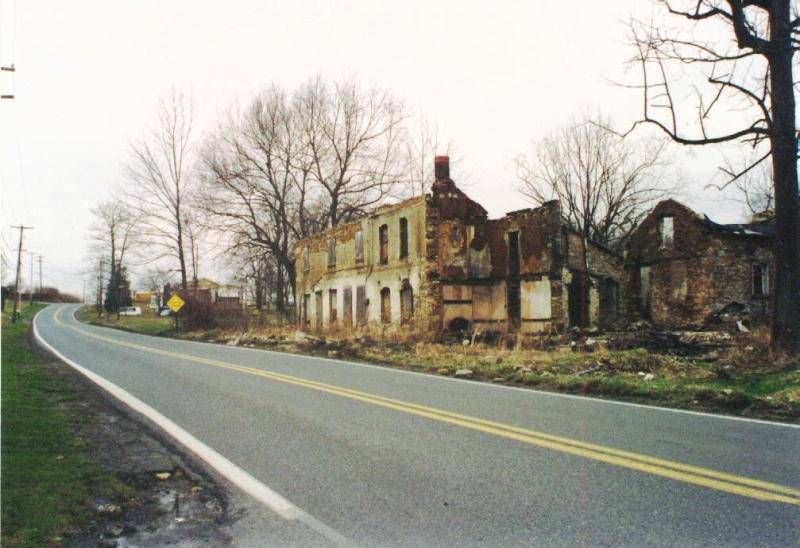 April 1993 picture of Frederick Kerchner stone home looking northeast after being burned down by vandals. Photo taken by in April 1993 by Charles F. Kerchner, Jr., a direct descendant of Frederick Kerchner. 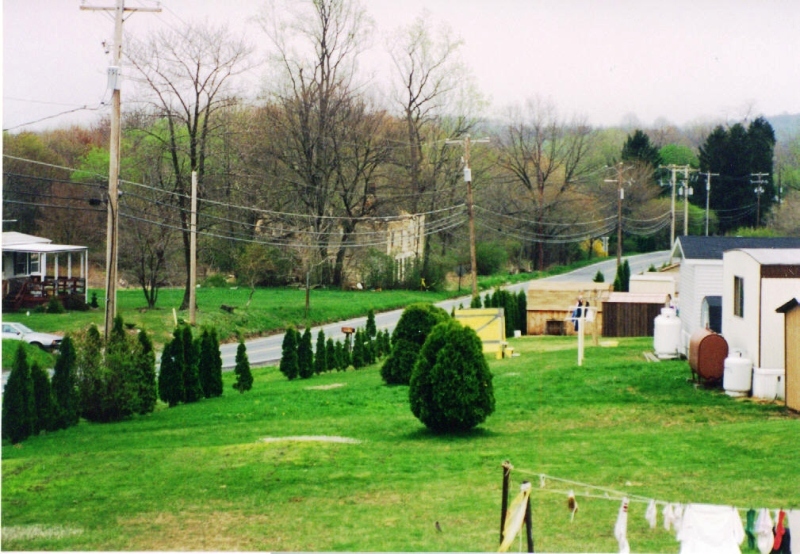 View of Frederick Kerchner home from across the road looking towards the southeast after it was burned down by vandals. Photo taken in April 1993 by Charles F. Kerchner, Jr., a direct descendant of Frederick Kerchner. Picture taken in April 1993 of what was once his farm land on which the Mountain Village Mobile Home Park was built. would be down the road just beyond the dense tree line shown in the left side, background area of this picture. This tree line is on or near the boundary line between Hereford and Longswamp Townships, Berks County, Pennsylvania. Photo taken in 1993 by Charles F. Kerchner, Jr., a direct descendant of Frederick Kerchner.